In the depths of northeastern India, in one of the wettest places on earth, bridges aren't built - they're grown. In order to make a rubber tree’s roots grow in the right direction – say, over a river – the Khasis use betel nut trunks, sliced down the middle and hollowed out, to create root-guidance systems. 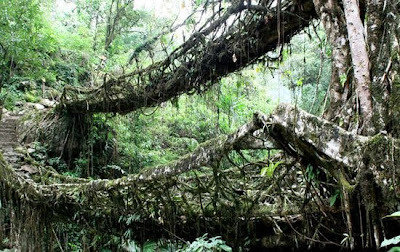 The thin, tender roots of the rubber tree, prevented from fanning out by the betel nut trunks, grow straight out. 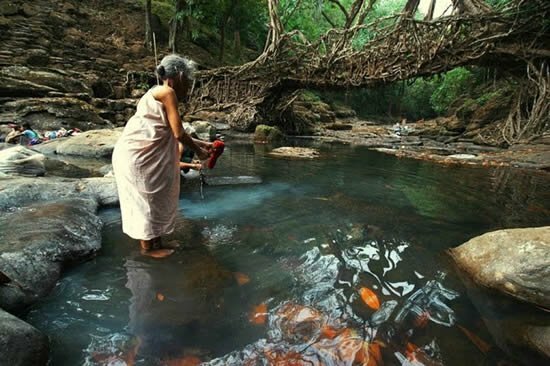 When they reach the other side of the river, they’re allowed to take root in the soil. Given enough time, a sturdy, living bridge is produced. 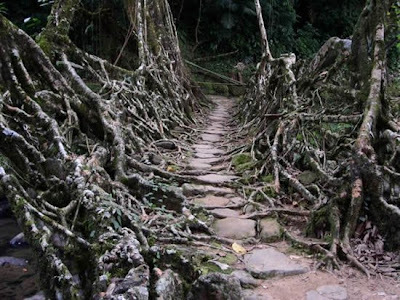 The root bridges, some of which are over a hundred feet long, take ten to fifteen years to become fully functional, but they're extraordinarily strong - strong enough that some of them can support the weight of fifty or more people at a time. In fact, because they are alive and still growing, the bridges actually gain strength over time - and some of the ancient root bridges used daily by the people of the villages around Cherrapunjee may be well over five hundred years old. 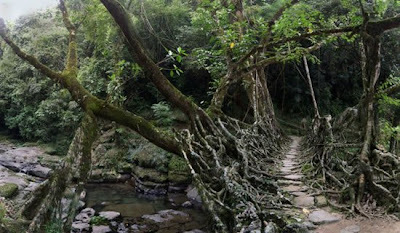 One special root bridge, believed to the only one of its kind in the world, is actually two bridges stacked one over the other and has come to be known as the "Umshiang Double-Decker Root Bridge." 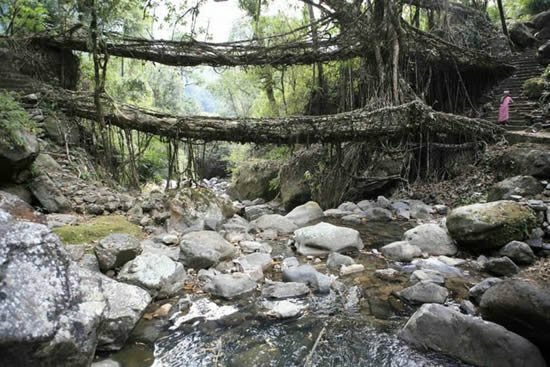 These bridges were re-discovered by Denis P. Rayen of the Cherrapunjee Holiday Resort. 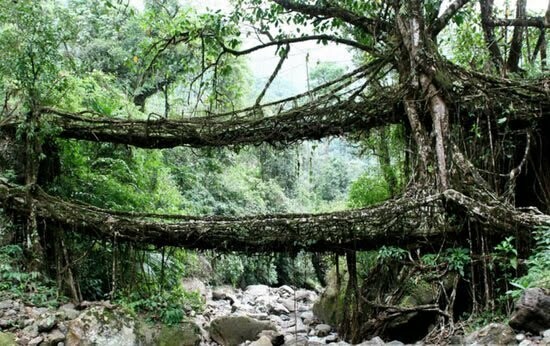 Due to his efforts to promote interest in the bridges, the local population has been alerted to their potential worth and has kept them from being destroyed in favor of steel ones. What's more, a new root bridge is currently being grown and should be ready for use within a decade. 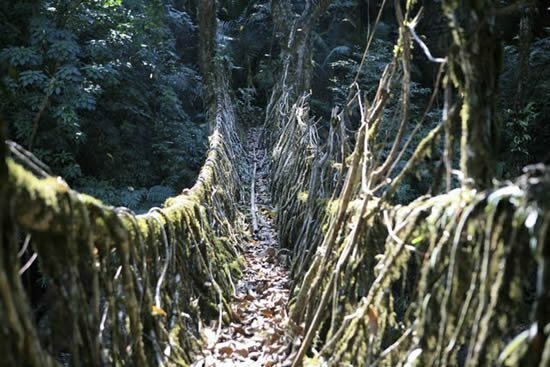 Nice information about the bridges in India. Thanks.